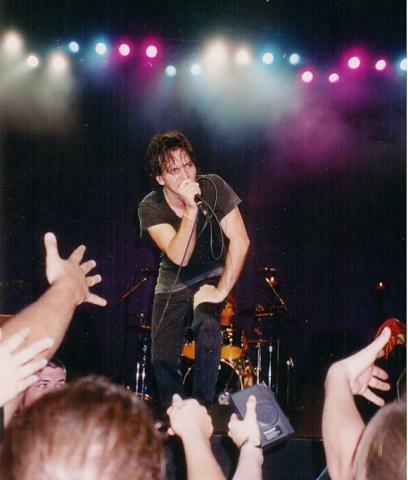 "Towards the end of the set, which included obligatory rockers such as 'Even Flow' and 'Daughter,' Vedder shared a personal memory with the crowd, saying that playing in San Francisco's Golden Gate Park reminded him of a situation 15 years ago when the band had to pull out of a San Fran show because Vedder had a severe case of food poisoning. Neil Young was brought in as the pinch hitter. 'I'd like to thank him for putting himself in harms way, in the service of rock 'n' roll,' said Vedder. As if in tribute (even though they often do this), the band closed their second encore with a pair of Young covers -- 'Throw Your Hatred Down' and 'Rockin' in the Free World.'" More on the day that Pearl Jam had a concert and Neil Young saved the day at the Polo Field on June 24, 1995 from Addicted to Noise's "DISPATCHES FROM THE FIELD". Another Archives review on Music Angle.com by Michael Fremer. UPDATE: 9/1 - The authenticity of these "rare" tracks is being called into question. Judge for yourself and let us know what you think. Buffalo Springfield's "Flying On The Ground Is Wrong" from unreleased Gold Star Acetate found in a box the attic at Ahmet Ertegun's summer house. There's a lot of speculation that the Buffalo Springfield "acetate" is not genuine. The vocal and acoustic guitar tracks are pretty clearly the same as the demo on the Archives and the BS Box Set. Now, it could be that the band added the other instruments and backing vocals to Neil's original demo back in 1966, but it could also be someone who is not the Buffalo Springfield adding the tracks very recently. Listen to the end of the guitar solo. That doesn't really sound like either Neil's or Stephen's styles. Until Neil's camp confirms its authenticity, I will be skeptical. I really wanted to believe, and got very excited when I first heard it, but I don't like being punk'd. Wow. That's a definitive version. Far better than any version up until now, far more a Neil Young song. Could have been on his first solo album. Um, I think those YouTube uploads of the Springfield are bogus. IMO, the guitar effects don't sound like anything available in the mid 60's, nor what Stills and Young used in their first months with the band. The uploader gets a 'Gold Star' for trying though. Real or Fake...these "acetates" sounds pretty cool and funky. For accuracy sake, i'd like to know if they're legit....regardless, they're a joy to listen to. And if these are not legit, kudos to the person who created the soundtrack and the video. Very authentic! Meanwhile, Thrash, that's a great photo you took of Eddie Vedder!